English Few people have more experience of backpacking footwear than passionate long distance hiker Chris Townsend. His list of long walks is almost as long as the distances he has walked, starting with a hike through Britain from Land's End to John O'Groats in 1978. He has used a lot of boots and shoes in the most diverse circumstances and that's what we are going to talk about in this interview. Chris has written sixteen books including the award winning The Backpacker’s Handbook (now in its third edition). One of his books can also be found in Swedish. Chris has been testing gear for various publications for decades. 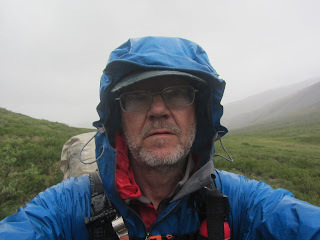 At present he is the Senior Gear Editor for Backpacking Light and the Gear Editor for the UK hiking magazine TGO. For Scandinavian readers it is of particular interest that he hiked through Norway and Sweden in 1992, plodding 2000 kilometers from the North Sea to the Arctic Ocean in one of the rainiest summers imaginable. More about Chris as a writer and photographer can be found on his website. All photos in this article are from Chris. Q: Chris, we´ve had recurring discussions on our website about the old adage that it takes 5 times as much energy to carry something on your feet than on your back. Lately I’ve also presented summaries of the scientific articles on this subject usually referred to in backpacking literature. What’s your opinion on weight of boots and energy expenditure? 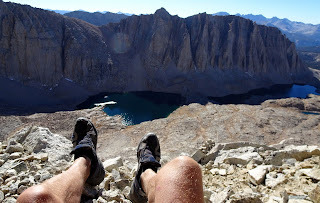 Chris: My conversion to light boots came during a Pacific Crest Trail thru-hike in 1982. I started out from the Mexican border in heavy, traditional boots that soon gave me hot, sore feet. After a few days I ended up carrying them in my pack and wearing running shoes brought along for campwear most of the time. When my running shoes were worn out after 1500 miles I bought a new pair of light approach shoes and dumped the heavy boots. The staff in the store were horrified that I intended to backpack a thousand miles in them. But my feet rejoiced in being released from their stiff leather prisons and my daily mileages went up. Q: OK, much more comfortable, but what about the weight? Chris: Weight is crucial for comfort. Boots weighing more than 3 pounds (1360 grams) make my feet ache after about 12 miles, and after 15 miles all I want to do is stop. Yet in shoes that weigh half as much, I can cover twice that distance before my feet complain. This is not surprising when you consider that I lift my feet about 2500 times a mile. That means I’m lifting 112 500 pounds (51 000 kilos) over 15 miles with 3 pound boots, versus 56 250 pounds (25 500 kilos) with shoes half that weight. That is an enormous difference. Q: One of our readers has come up with querie on this subject. It goes like this: You are carrying a 25 kg pack and running shoes. You are given a choice between adding 5kg to your pack and continue to hike or to put on boots that weigh 1 kg more than the runners and continue with the 25 kg pack. What would you choose? Chris: I think that's answered by my experiences on the Pacific Crest Trail. I would, like then, add 5 kg to the pack and keep the light shoes. Q: One thing that you talk and write about is “the ankle-support myth”. That is very strongly put. Could you explain what you mean by this? Chris: One of the main arguments for heavy, stiff footwear is that you need it for ankle-support when carrying a heavy pack or hiking on rough terrain. This is not true. To begin with most walking boots offer very little ankle support since their soft cuffs give easily under pressure. My plastic telemark boots give good ankle-support, but I can hardly walk in them. Stiff-ankled boots and natural foot movement do not go together. What actually holds your ankle in place over the sole of a shoe is a rigid heel counter, found in good quality running shoes as well as trail shoes. And I’ve now done enough walking in sandals that I’m not convinced that any support at all is needed if you have strong ankles. Q: In one of your books you write about an occasion when you were testing a pair of high top leather boots without heel cups. Chris: Yes, it was a bit ironic. On rough terrain they were worse than useless, my feet constantly slid off the insole and my ankle kept twisting. I ended up only using them on good paths and for mountain ascents I wore the running shoes I’d brought along as campwear. Mountain runners never wear boots, try running in boots and you’ll see why. For traversing steep, rugged terrain you need strong flexible ankles and light, flexible footwear. Doing exercises to strengthen your ankles is better than splinting them in heavy, rigid boots. Q: Sometimes you hear the claim that stiff, rounded soles on boots make it easier to walk than shoes with more flexible soles, since the design makes you "roll" over the soles. What's your opinion? Chris: Stiff, rounded soles make it easier to walk than stiff flat soles because they do follow your natural foot movement to some extent. But they're still harder to walk in than flexible soles that don't restrict natural foot movement at all. Q: Very common is the recommendation that the heavier the load and the rougher the terrain the heavier boots you need. “For demanding hikes and expeditions” are taglines often used for the heavier boots. What’s your opinion on this? Chris: I disagree. In my experience restricting normal foot movement with stiff soles, heel to toe stiffness, makes me feel unstable and insecure. Lateral stiffness, from side to side, is fine, this stops your footwear from twisting under your feet when you traverse steep terrain. It’s not needed on most trails though. Stiff soles simply cannot flex enough to accommodate to the terrain. I find that they prevent me from placing my feet naturally, leading to a slow and clumsy gait, which could lead to injury. Also, straining against the stiffness requires energy and is tiring. What really protects against rough terrain is footwear that cushions your feet and stops stones and rocks from bruising them. The best way of doing this is with a hard but flexible midsole plus a shock-absorbing layer. In flexible footwear you can place your whole sole in contact with the ground, rather than digging your heels in or the boot edges. Sole stiffness is needed only on steep, hardpacked snow. Then a bit of stiffness makes it easier to kick the boot toes and edges into the snow. Q: There is a wide range of boots for different purposes and different terrains. It does not sound like your opinion would be to popular with people selling these? So does all this mean that you are against boots for backpacking? Chris: I wouldn’t say I was against boots. Some of my best friends wear them! And I’d rather have light, flexible boots than heavier, stiffer shoes. But I don’t think boots are necessary and I think that the boots for different pack and terrains idea is nonsense. Light flexible boots are suitable for all types of terrain bar steep snow and ice. Q: What kind of footwear do you choose yourself for different kinds of backpacking trips today? Chris: My current favourites are Inov8 Terroc shoes and Teva Terra Fi-2 sandals. Of the two I just prefer the Terrocs as they are more versatile. In hot weather I wear them without socks and they are almost as cool as sandals whilst in cool weather I wear them with merino wool socks and my feet stay warm even when wet. Thanks for the great interview, it was interesting to read this Q & A session. I am of the same opinion than Chris, that trail runners are a lot more natural and comfortable than boots, though I am just a recent convert to this walking style.